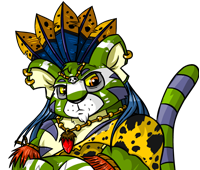 Hi, as you know over the past few weeks or so we have experimented with a 468x60 pixel banner on the top of the Neopets page. We are aware that this was mostly unexpected, and caused a few problems initially, however after three weeks the banners aren't really working out at all. Unfortunately, it seems that most of the industry has moved on to larger sized-banners. So basically, in order to keep Neopets a free site we really do not have much option but to move to the newer 728x90 banner size. We know it does take up a lot of room but there is not much of an alternative. We have been working on a new template over the last few days that tries to incorporate the banner without moving the page content down that much, and you can see the results, it has only really moved stuff down overall by around 12 pixels. Also the frequency of sponsor ads will be increasing, but there will still be Neopets-related ads. The good news is that as a result we should be able to invest more into our servers (faster site, hopefully less crashes) and produce a lot more games. We will also be starting a big multi-player game initiative over the next few months so you will be able to play Neopets games real-time against any other player on the site. This could be puzzle games, and we may even have action and fighting-style games (Meepit vs. Feepit!) Instead of just one or two games coming out to accompany our future three month story-arcs, we're aiming for a lot more. Also, we will soon be releasing more side bar themes, and we will start putting out rare Neopets-themed banners that contain Random Events (mostly good ones). Just to re-inforce what we have said before, there will never be any pop-ups, pop-unders, spyware, interstitials or anything like that on the site. We hate those as much as you do! Although the top 90 pixels will probably be some sort of ad, the rest will remain mostly ad-free. Also, the site will always remain free to play. Anyway, the new changes will be for the best. Thanks to everybody for playing the site and lots of exciting content, puzzle, games (and possibly another Card of the Day) are on the way!